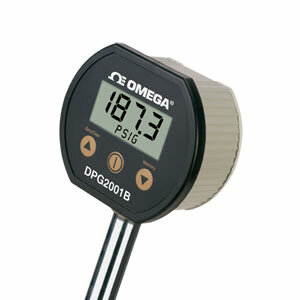 OMEGA’s DPG2001B Series digital pressure gauges are high accuracy battery powered gauges that include many premium functions at no extra cost. Options are available for a NEMA 4X case and backlighting. Each unit has a dual display (digital and alphanumeric), memory for 6 readings, front panel auto zero, auto shutoff from 1 minute to 8 hours, and up to 15 selectable engineering units depending upon the range. 注: Comes complete with operator’s manual and 2 "A" batteries. To order with optional 5-point NIST calibration "-NIST" to model number and $150 to price.